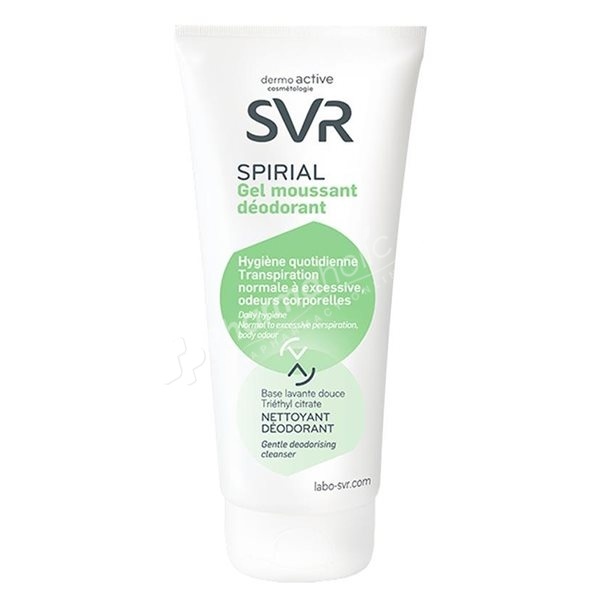 SVR Spirial Foaming Deodorant Gel gently cleanses the skin, fighting against the birth of odors for sensitive skins, thanks to its gentle cleansing soap-free with physiological pH basis. SVR Spirial Foaming Deodorant Gel gently cleanses the skin, fighting against the birth of odors for sensitive skins, thanks to its gentle cleansing soap-free with physiological pH basis. Enriched in glycerin, this gel does not dry the skin and is suitable for adults and children. For normal to excessive perspiration. Apply on a wet skin. Let it foam, then rinse and dry. Aqua (Purified Water), Disodium Laureth Sulfosuccinate, Peg-90 Glyceryl Isostearate, Peg-7 Glyceryl Cocoate, Glycerin, Sodium Cocoamphoacetate, Sodium Laureth Sulfate, Triethyl Citrate, Lactic Acid, Laureth-2, Glyceryl Caprylate, Dimethyl Phenylpropanediol, Sodium Chloride, Sodium Sulfate, Pentylene Glycol, Methylchloroisothiazolinone, Methylisothiazolinone.